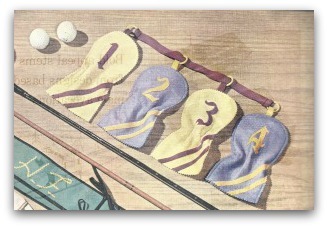 This free golf club covers pattern is a great idea for your golfing friends on your Christmas list. 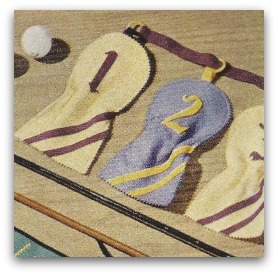 Personalize your gifts for the sportsman or woman on your list with these clever accessories. He'll appreciate covers to keep his equipment looking as bright and new as it does on Christmas morning. Mits use eight 5x9" pieces felt, one 3/4x15" strip felt of contrasting color, scraps of felt in contrasting colors for numerals, 4 curtain rings. 1 yard cord elastic. Trim 5X9" pieces with pinking shears, curving top comers. From scraps cut four 3/8 X 6" strips, four 3/8 X 4" strips. Pin strips diagonally across lower right corner of four front pieces 3/4" apart; stitch. Pink ends of strips. Trace numerals on scraps of felt. Cut out. Pin on front piece, sew along edge. On wrong side of back pieces, mark a line crosswise, 3 1/2" above lower edge. Zigzag stitch over cord elastic on line, stopping 1/2" from each edge. Tie thread ends. Draw up elastic to 2 1/4", knot ends. Cut four 1/2X2 1/2" strips felt. Fold each piece over a ring. Pin, with ends together, to underside of front pieces at center top. Stitch front and back together, right sides out, 1/4" from edge. String 15" strip through rings. 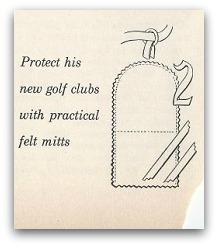 Fold ends over rings of mitts 1 and 3: stitch.